1 Ishmael: Enough distractions! Now, where's that asteroid we need to destroy? 2 Loren: You're too late. It's gone past us. You've missed your chance to save the Earth. 3 Loren: The asteroid will hit in three days. We don't have the speed to stop it. 4 Ishmael: There must be something we can do! 4 Loren: I have popcorn. 5 Hitler's Brain Clones: At last, die moment has arrived! Activate die time machine! 6 Erwin: I do not think that is a wise idea, mein Führers. Travel to die past could tear apart die very fabric of die universe. 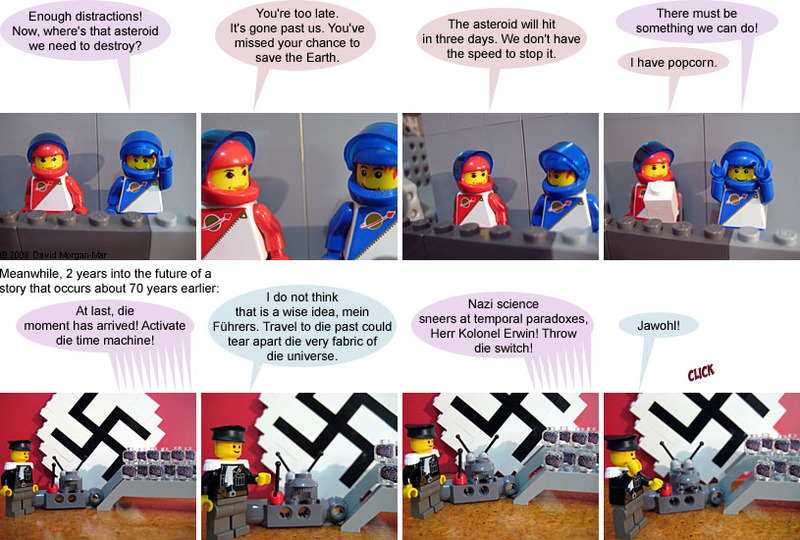 7 Hitler's Brain Clones: Nazi science sneers at temporal paradoxes, Herr Kolonel Erwin! Throw die switch! It's bland and boring, with a texture like styrofoam with annoying crunchy bits that get stuck between your teeth. As far as I can tell, it's really only there to serve as a base to add flavouring to. For that purpose, give me potato chips any day. Yeah, they're crunchier and not so suitable for eating during movies, but then I don't want to eat while I'm watching a movie anyway. I guess at least I can be grateful that people who do eat during movies generally aren't crunching on chips. Last Modified: Sunday, 28 December 2008; 02:11:01 PST.